The "Tomorrow" cd-single comes in a Digipak with white plastic tray. View front and back artwork from the image gallery on the left side of this page. 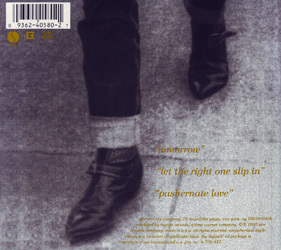 The inner side of the Digipak's front panel shows the same image as on the back, but there are no barcode or logo in the top left corner, and the full single credits are printed in the same gold colour, justified to the right side of the boots. The disc is silver (uncoloured) with black text. Morrissey's name appears at the top, a block of Sire/Reprise credits on the left, the track listing, a mention of "Your Arsenal" and publishing info on the right, a production credit at the bottom above logos for Sire, Reprise and Compact Disc and the catalogue number. Because of its different shape, the artwork of the 12" format shows a bit less of the usual image on the front and a bit more on the back, comparatively to the compact disc format (view front and back artwork on the left). Copies that are still sealed have a round black sticker on the front stating "Also Available on Compact Disc Maxi-Single" in white. The record was pressed on purple vinyl and is slipped inside a clear anti-static inner sleeve. Its labels are the usual yellow Sire ones, with blue Sire logo at the top, black Reprise logo and catalogue number on the left, contents and credits at the bottom, and RPM on the right. The cassingle comes in a card slipcase open at both ends. The usual front artwork was slightly cropped for the front of it (view left). The back artwork was also adapted to the format (view left). The spines are white with gold text. 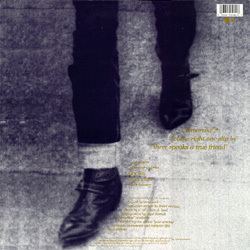 Morrissey's name and "Tomorrow" are printed on each of them in the same fonts and colour as on the front, between the catalogue number and a CS logo. The cassette is made of black plastic. At first glance it looks like its got black glossy paper labels with white text, but the text is actually printed on the cassette itself. It's just that the plastic has a glossy finish in the centre area where the text is found. Morrissey's name appears top-centre on each side, above the title of the song featured on that side. The catalogue number is on the left between a Sire logo above and a Reprise logo beneath. This single was mainly promoted via stock copies of the 12" stamped with a promo warning in gold ink on the back of the sleeve. The black sticker advertising the single's additional availability on compact disc which is usually found on the seal of the stock 12" was affixed directly onto the sleeve of the promo because promos were never sealed. The release of this single was also promoted with the help of a very limited one-track promo cd of the title track. This is without doubt the rarest of all Morrissey promo cds made by Sire/Reprise. Strangely, the cd was distributed at the time of release of "Tomorrow" as a single, but it features the album version of the song instead of the expected single mix, and advertises the song's availability on the "Your Arsenal" album and not the "Tomorrow" single. The disc is silver (uncoloured) with black text. Morrissey's name, the title track and the song length are printed at the top, a block of Sire/Reprise credits on the left, a promo warning, a mention of "Your Arsenal", songwriting and publishing credits on the right, a production credit at the bottom above logos for Sire, Reprise and Compact Disc and the catalogue number. It was distributed in a plain jewel case without any front or back artwork. Note: The 2-track promo cd of "Tomorrow" numbered PRO-CD-5637 was distributed before the release of the "Tomorrow" single and actually served to promote the release of "Your Arsenal". See the latter album's collectors appendix for information. Warner Bros included the video for "Tomorrow" and footage of a recent instore appearance on one of their various artists promo video compilations, alongside material by other artists such as Eric Clapton, Lindsay Buckingham, the Black Crowes, Faith No More, Ministry, L7, Body Count, the Damn Yankees, etc. The videocassette has no front/spine label, only a white sticker label on its top side. It states, amongst other things, "In-store Play/Video Show #192", "Warner Brothers Merchandising Department", "12 Videos Tied", the total length "53:50" and the date "09-08-92". The videocassette comes in a black hardshell videocase with white sticker label in the wraparound display pocket (sticker not stuck, still on waxed paper). The information from the sticker label is repeated on the case's front and spine, with the extra catalogue number on the spine. The track listing is printed on a large sticker on the inner side of the videocase. The "Tomorrow" video was also included on the September 1992 issue of the Rockamerica video compilation series, alongside material by 14 other artists such as Electronic, Pearl Jam, the Jesus And Mary Chain, etc. Information on the packaging is needed. The video for "Tomorrow" was included on issue 114A of the promo video series Telegenics, alongside material by other artists such as the Jesus And Mary Chain, David J, the Heart Throbs, House Of Love, the Flaming Lips, Meat Beat Manifesto, Suzanne Vega, Sinéad O'Connor, etc. The videocassette comes in a hardshell case with pale blue track listing insert in the display window. The videocassette has a white sticker label on its top side, with a red Telegenics logo at the top and a few lines of printed technical data (catalogue number, 'Stereo', 'Dolby', copyright, etc.) beneath it. Some copies also have a big bright orange/red round sticker partly over the latter identification sticker. This sticker features some sort of warning under the header "Attention". The promotional film for "Tomorrow" was featured on volume #??? of the ETV video compilation series. Other artists featured on the compilation include INXS, Paul Westerberg, Annie Lennox, David Byrne, etc. Information on the packaging is needed. A set of two mastering reference cassettes featuring the material released on the cassingle format has made it into the hands of a collector. 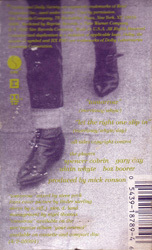 One cassette features the single mix of "Tomorrow" and the other the b-side "Let The Right One Slip In". Both cassettes come in their individual generic case including a generic "Bernie Grundman Mastering" insert with white and yellow spine showing the mastering company's logo on the left and typewritten release information such as the catalogue number "#4-18789" and date "7/29/92". The first cassette has "Side A: Tomorrow (Remix W/Piano) 4:17" printed on the front of its insert, the other one "Side B: Let The Right One Slip In (Non-LP) 2:26". The blue print back flap in both cases has the contact information for Bernie Grundman Mastering and a reproduction warning over a few lines. Inside are TDK SA-X50 tapes with generic white sticker labels on which "MORRISSEY/Warner Bros. A-sde #4-18789" (or "B-sde" for the other) is printed in black. This reference cassette pre-dates the set described above and comes with different packaging. It features three Steve Peck mixes for the upcoming "Tomorrow" single: a 4:02 "single mix", a 4:22 "single mix w/louder vocal" and a 4:22 "instrumental mix". The insert is white with black text and logos. 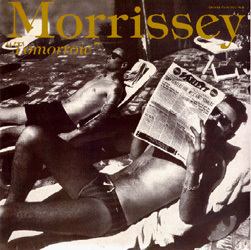 The front shows Morrissey's name at the top, above "Tomorrow Steve Peck Remixes", next to a Reprise logo. The track listing is printed beneath that, with handwritten song lengths. The spine states Morrissey's name and "Tomorrow Steve Peck Remixes" next to a Reprise logo and above an address in Burbank, CA. The back flap repeats Morrissey's name and states the date ("07/01/92"), "(CASSETTE)" and "IHS/RH" (in-house/studio personnel initials). The cassette is a generic one with no visible brand name. It has generic sticker labels with Morrissey's name and the title printed in black on them.